The article states “A few of the factors driving the market currently include trade uncertainty, weather, the size of the U.S. crop to be harvested, and world supply and demand. One factor that may point to some optimism for prices next year is the fact that the U.S. has had four years of record crops in a row with another likely again this year. The odds of having a correction year soon are good.” The emphasis is added by us. We’d like to add a bit of color to this statement. We seek to clarify that weather should not be the reason why the odds of a corn market prices recovery in 2019 are good. This factor is why CropProphet exists. The data supporting this statement is shown in the graph below. The corn yield deviation was almost +7 bpa above trend in three out of the last four years. It’s not 100% clear, but the statement seems to suggest the weather factor is the cause of the good odds. It was the cause of the 4 previous good years. It would be logical that weather is the factor attributed to creating the good odds of a correction year. We do not agree with this statement. Why? The weather conditions from one summer to the next are essentially independent of each other. 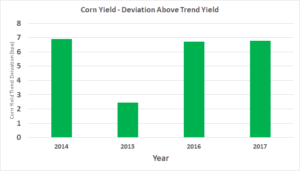 Assuming yield variability from year to year is 100% driven by weather conditions during the crop season (after considering the yield technology trend) means the previous 4 years of above trend yields are irrelevant to the odds of a good or bad crop year in 2019. So, what are the odds? From 1979-2017, the US corn yield deviation from trend had the same sign (i.e. positive yield or negative yield) as the preceding year in 22 of 38 years, i.e. 58% of the time. Therefore, the sign of the US corn yield deviation from trend was different year over year 42% of the time. The corn yield deviation from the technology trend was greater than zero in 54% of the years from 1979-2017, as indicated in the chart below. One interesting note from the chart below is that the distribution of yield deviations is skewed. Negative yield deviations are rarer, but because of the potential for drought years, the magnitude of the negative yield deviations can be much larger than the positive yield deviations. 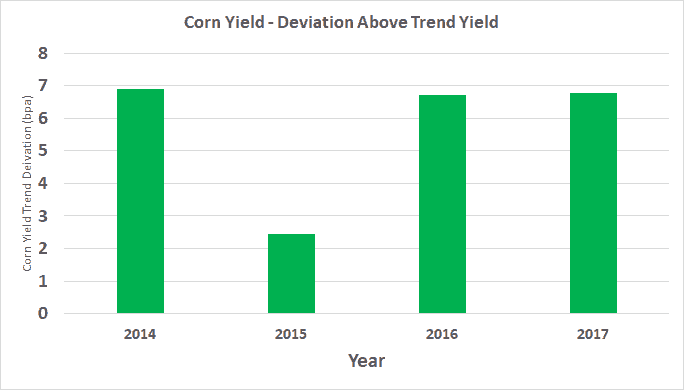 With the 2018 crop season not yet over, the fact is that 4 or 5 positive corn yield deviation years means relatively little when thinking about the odds of weather driving a correction for 2019. Weather will be an important factor in 2019, just as it is every year. It could be a horrible crop year. But the the odds are actually slightly greater than even 2019 will be another positive year for yield, relative to trend. The article goes on to state “With so many factors impacting the market, it makes it very difficult to predict when the market will move from the levels we are at today.” This is absolutely correct. Yes! Get me my trial! Our '18 US Corn Yield Forecast Was Off Only 0.2%. Don't Be Surprised in '19!